Along with our usual review of the weekend successes, this edition will also address racing at Delaware, Ohio, where the Grand Circuit meet is in progress, concluding Thursday, Sept. 22 with the Little Brown Jug program. Since our weekend-related blog will go to cyber-press on Thursday morning (EST), this edition will cover the major event, as well as some others at the fair, with the assistance of our exclusive Breeders Crown Countdown blog. For late updates and info, check that blog and follow us on Twitter. First, a review of this past weekend, where we were once again at Mohawk, Friday, Sept. 16 and Saturday, Sept. 17. We suggested two possible overlays for Friday’s trio of stakes and got only one true value play, Talbotcreek Jewel in the Peaceful Way Consolation. The filly paid $10 as our other choice broke and literally ran out of the money. In the “Wellwood” consolation, we got nabbed at the wire by an 8-1 shot, so Melt In Your Mouth was indeed better than the big favorite (that broke again, as we predicted) but went too fast too early and was short. The winner just got an easy trip. We set out to beat Lady Rainbow in the Moni Maker Final at the Meadows but never expected her to be 3-1, which made her the choice over Beatgoeson Hanover. “Lady” won and paid $8.40. On Saturday night, the Wellwood final went our way just as we expected and The Game Plan won, paying $9.20. We were right, the frosh-colt trotter was not the top choice of the three probable favorites. We went solely with him and won. In the Peaceful Way Final, our second choice, Win Missy B went a record-breaking mile but only at 2-1, while our top choice, Miss Paris, got third. The colt coming in second at 30-1 was Whatever It Takes, who we liked to win one of last week’s elims. He closed just like he did last week but was not doing so in a herd of horses. He paid $19.80 to place. The rest of our winners were hardly worth plays. Anndrovette won a Milton Stakes elim in a dead heat, reducing her price to $2.60. At Indiana Downs we nailed all of the three stakes, including Sweet Lou ($2.20), Rocknroll Dance ($2.10), American Jewel ($2.10), with Podges Lady second for a $5.40 exacta. Following us on Twitter offers you late picks on races not included in this blog and updates on choices we speak about here. As well as tweeting some profit-making plays, we have some fun. There are only two elimination heats for the “Jug” and a pair for its sister affair, the Jugette on Thursday, Sept. 22. Each heat except one in both races presents six horses (Jugette elim one has only five). This is unusual, since the glamour-boy-and-girl pacers have a talented crop and many more were eligible to these races than dropped in the box. Even with the retirement of Big Jim and the dismissal of See You At Peelers from taking on the boys or even racing in her own division, this group is small. 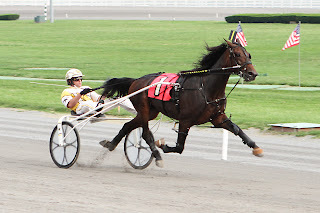 As well, Betterthancheddar connections came up with $45,000 to supplement their colt, being the only one that can win the Pacing Triple Crown (he won the Cane Pace, jewel one). Obviously missing are Shadyshark Hanover and Fashion Delight. Even though “Shady” has not had the season expected of him at three, he shone on Hambo day with a record mile, showing signs of greatness. That was it for wins, though, and trainer Erv Miller decided against entering him in the Jug. Fashion Delight suffered a “minor injury” after he won the Empire Breeders Stake at Tioga. “He suffered an abscess in his front-right foot after his victory,” said trainer Jim Campbell. “It’s an unfortunate situation, but we had to do what’s best for the horse and leave him home.” The problem must be worse than minor, since “Fashion” has stayed home since the Tioga win. Also MIA: Feel Like A Fool, Dancin Yankee, Eighteen, Great Vintage, Real Special, Roadside Delight, Rockabillie, Watermelonwine and Wind Me Up. These eligibles have all made more than $100,000 this year and could have added at least one more elim heat. With only two elim heats and a dozen competitors, the first five from each elim gets to the second heat (the final if one of the elim winners has a victory, else there is a race-off with the three heat winners). Other six-digit winners this season that could have supplemented with decent chances include Mystician, Alsace Hanover, Bestofbest Hanover, Prodigal Seelster, Townslight Hanover and Rock Em. The Jugette representation is also thin. The track programmer made Idyllic the morning-line favorite to win the event. That was a tough call. We can see a few upsets if the big money goes to Idyllic. The second (and final) heat will carry a purse of $175,410. This is the first year that the winner of the second heat will be declared the Jugette champion. In previous years, a filly had to win two separate heats to be the Jugette champion. More on the competitors and the complete rundown of Sept. 22’s events at the “Countdown” blog. If you have been injured due to someone's negligence ,it would best to mind all your actions because some insurance companies will do anything to save the money from compensating your injury. Best to always sought the best ones in town. We have forgotten the basic SOCIAL CONTRACT of rights and responsibilities that binds us together as a society. Society expects citizens to follow laws it has instated in order to protect individuals and institutions. Without these laws there would be chaos -- the strong would simply take anything they wanted and the rest would have no recourse. In return the social contract guarantees that if people follow these rules or responsibilities they will be guaranteed basic rights - life, liberty and the pursuit of happiness.